FORT DEL PILAR, Baguio City – The Philippines and South Korea are expected to sign this week a multibillion-peso deal that would allow the military to acquire 18 lead-in fighter trainer jets. “Within next week, starting Monday, within that week, we will have a signing of contract for the FA-50 (jets) with the South Korean government,” Defense Secretary Voltaire Gazmin told reporters here. He said a deal involving the purchase of eight combat utility helicopters from Canada may also be forged this week. 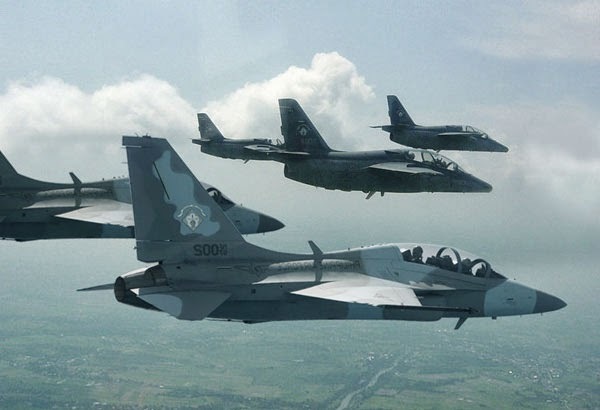 Last month, the defense department and the Korea Aerospace Industries (KAI) completed the negotiations for the lead-in fighter trainer jets project which has an approved budget of P18.9 billion. KAI will be supplying FA-50 jets, which are derived from the family of T-50 advanced jet trainer air assets. The jets will be used for territorial defense operations. The first batch of jets is expected to be delivered late next year. KAI is required to deliver at least two air assets within 18 months after the signing of the contract. The delivery is expected to be completed by 2017. FA-50s are air assets that have fighter capabilities but have some features that are different from more advanced fighter jets. The FA-50’s design was drafted from the Lockheed F-16 fighter jet. The F-16 aircraft has a very long list of weapons that are certified for use while the weapon capabilities of the FA-50 are limited to the low-cost missile systems. Lead-in trainer jets can be used to prepare pilots for more advanced air assets. The Philippines will make an advance payment worth 15 percent of the total contract price to KAI. Malacañang has also allowed the defense department to tap a progress payment scheme, where the government would pay the supplier based on a mutually agreed upon payment schedule.